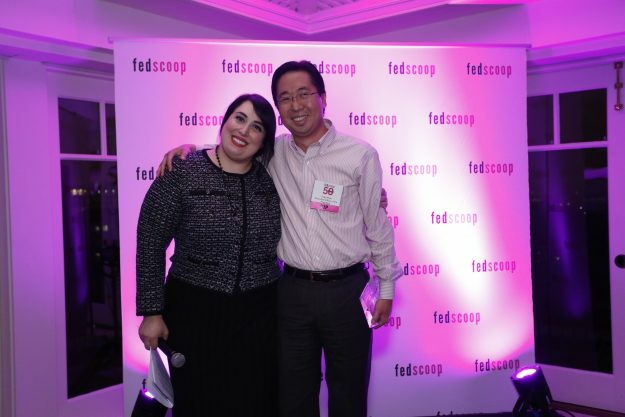 FedScoop founder and CEO Goldy Kamali and White House technology advisor Todd Park. FedScoop honored Washington’s top technology leaders and innovators during its elite FedScoop 50 awards Thursday night. The ceremony, held atop the Hay-Adams Hotel overlooking the White House, gathered more than 200 government and industry leaders from across the country to recognize the extraordinary achievements they made in 2015. FedScoop celebrated leaders and programs in nine categories that touched all aspects of the federal IT community — including Disruptors of the Year, Cybersecurity Leadership, Most Inspiring Up & Comer, Federal Leadership, Industry Leadership, Tech Champion, Tech Program, Innovation of the Year and the most prestigious Golden Gov award. The federal IT community this year voted with ferocity, casting more than 250,000 votes for the nominees. FedScoop counted the votes to determine the winners in each category.